I am indebted to Robert Temple for the bulk of the information contained in this article and the majority of the illustrations used appear on his website at http://www.egyptiandawn.info. In a seldom visited and uninviting part of Morocco, not far from the Atlantic coast, away from major tourist attractions and decent roads lies a remarkable and enigmatic megalithic site. The Mzora stone ring (also spelled variously Msoura/Mezorah) is situated roughly 11km from the nearest town of Asilah and about 27km from the fascinating, overgrown ruins of ancient Lixus. 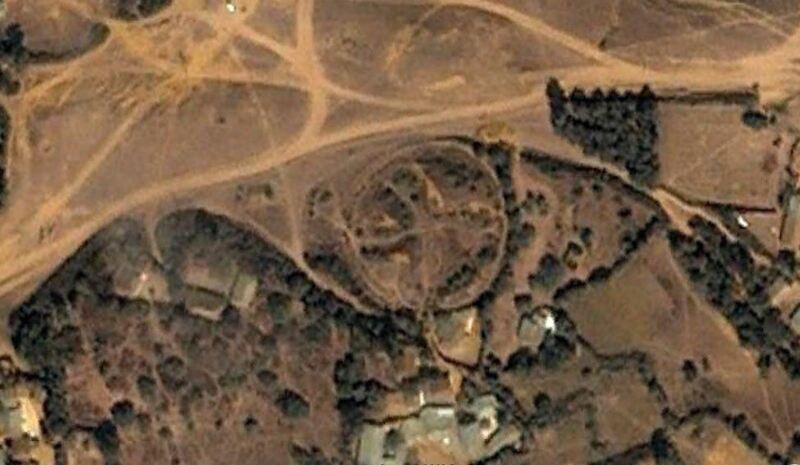 It is not easy to reach and guide books to the area are of only very limited use (for a detailed discussion of its precise location including GPS co-ordinates see http://lostcities.weebly.com/1/post/2011/01/re-discovery-of-moroccan-megalithic-stone-circle.html). A small display in the archaeological museum at Tetouan is the most the majority of visitors see or hear of this extraordinary place. Mzora is largely absent from the historical record but Plutarch, in the first century A.D., may have referred to Mzora in his Life of Sertorius. He describes the Roman General Quintus Sertorius being told by local inhabitants about a site they knew as the tomb of the giant Antaeus who had been killed by Hercules. There are many other ancient accounts that place the tomb of Antaeus in close proximity to both Lixus and Tangier and it is quite plausible that Mzora is the inspiration behind these stories. (Temple, Robert (2010). Egyptian Dawn. London: Century. P386-7). The site itself is a Neolithic ellipse of 168 surviving stones of the 175 originally believed to have existed. The tallest of these stones is over 5m in height. 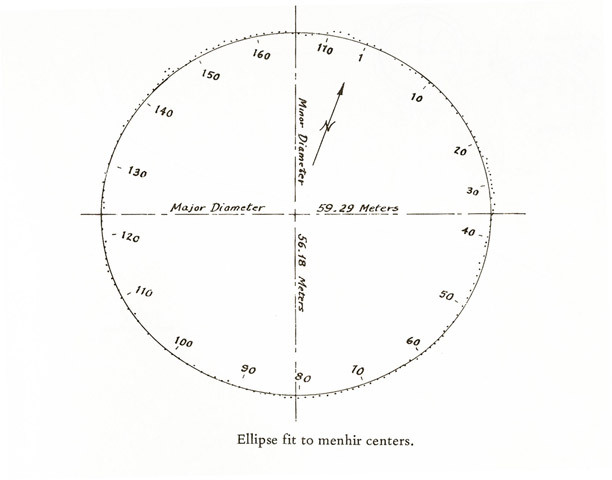 The ellipse has a major axis of 59.29 metres and a minor axis of 56.18 metres. At the centre of the ring, and quite probably a much later addition, is a large tumulus (the tomb of Antaeus?). Not much remains of this tumulus today, the bulk of the damage to it seems to have been done by excavations undertaken in 1935-6 by César Luis de Montalban. It was he who cut across the mound in two intersecting trenches leaving the distinctive ‘X’ shaped scar visible today (Temple, Robert (2010). Egyptian Dawn. London: Century. p378). The only professional survey of the site was conducted in the 1970s by James Watt Mavor, Junior of the Woods Hole Oceanographic Institute in Massachusetts, USA. It is this survey that revealed Mzora to be not only remarkable in its own right but to have implications for the history of megalithic sites in Britain. As hinted at by Geoffrey of Monmouth above, Mzora, incredibly, appears to have been constructed either by the same culture that erected the megalithic sites in France, Britain and Ireland or by one that was intimately connected with them. The ellipse is constructed using a Pythagorean right angled triangle of the ratio 12, 35, 37. This same technique was used in the construction of British stone ellipses of which 30 good examples survive including the Sands of Forvie and Daviot rings. “The remarkable thing is that the largest, the 12, 35, 37, was known and exploited more than any other with the exception of the 3, 4, 5.” Thom, Alexander (1967). Megalithic Sites in Britain. Oxford: OUP. p.27. “If a ‘megalithic yard’ of 0.836 metres … [is used] … then the major axis and the perimeter of the ring take on values nearly integral.”Temple, Robert (2010). Egyptian Dawn. London: Century. p379. “When Megalithic man set out a circle with a diameter of 8 units he found the circumference very nearly 25 units but in general he could not get nice whole numbers like these for both the diameter and the circumference simultaneously. Probably the attraction of the ellipse, and we know of over 30 set out by these people, was that it […] was easier to get the circumference near to some desired value.” Thom, Alexander (1967). Megalithic Sites in Britain. Oxford: OUP. p.31. 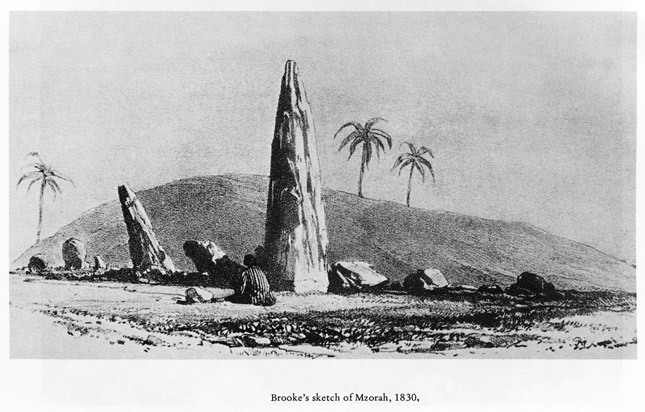 Mzora isn’t the only stone circle in Africa to share its construction methodology with British sites. 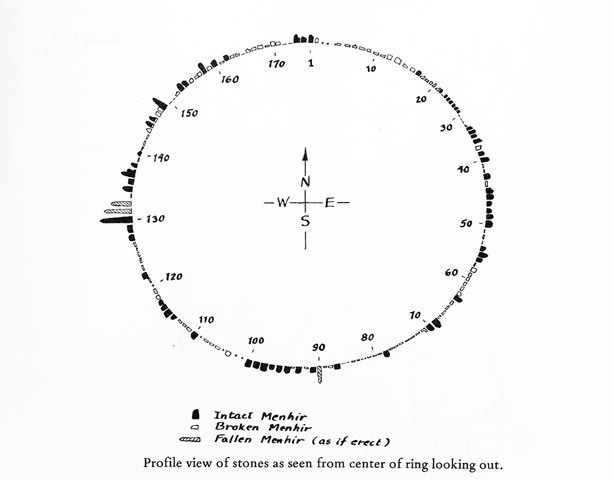 The Nabta Playa stone ring in Southern Egypt conforms to Alexander Thom’s “Type I egg” geometry. Stone 30 marks the summer solstice sunrise. Stone 146 marks the summer solstice sunset. Stones 61 and 62 mark the winter solstice sunrise. Stone 118 marks the winter solstice sunset. Temple, Robert (2010). Egyptian Dawn. London: Century. p391. In Mzora we have a fascinating and important site that challenges many assumptions about stone circles in Britain as well as raising a great many more questions. At present the site is unmanaged, exposed and vulnerable. It is a great injustice that this monument isn’t given world heritage status and the protection it richly deserves. For further discussion of the importance of this site see Chapter 8 of Robert Temple’s book, Egyptian Dawn (2010). there is now a warden at the site and a signpost from the main road from larache to tetouan,its about 3 kms after the village of souk tnine de sidi el yamani( a mere petrol stop),heading for tetouan on the left hand side.i visited the site in late january this year2012. I visited this site (M’Zopra) in 1982 and was astonished to see a similarity to the megalithic Newgrange site in Co. Meath, Ireland. No archaeologist in Ireland was aware of this similarity. I was pointed towards it by an Italian archaeologist. Subsequently I met James W. Mavor and his brilliant paper confirmed my belief that early Irish constructions were ultimately inspired by North African designs. I am now revisiting the subject of Carthage as an early coloniser of Ireland. I know that place, the locals are calling it as AL METWAD. my wife was born in the same place just a few meters behind. that place is not well respected as is one of the archeological sites in Morocco that I took in consideration and even many pictures. I’m a tourguide in Dubai know, and this my job and my responsability to talk and to defend such monument ignored by the UNESCO. Morocco is one of the tourist destinations that everyone hope to step on once, because of his commitment to preserve the history the culture the traditions the religion and the languages. A country of contrasts. Reblogged this on uberslan's Blog. De Montalban, digging at Msoura/Mzora was arrested at the Spanish Civil War. None of his records survived. Vandalism invites more vandalism, and the local followers of islam drilled holes in the standing stones and broke them. The monument features an internal walkway or parapet, and at some distance is another ring of small stones which follows the ellipse formed by the standing stones. There are ruined outliers. The Msoura ellipse is perfect and in Britain the closest parallel is the smaller Druid’s Circle on the Penmaenmawr. Headlands, presumeably both rings were set out according to the same geometric principles. The 12th century scribe Geoffrey of Monmouth related the circle from which the sorcerer Merlin obtained the stones for Stonehenge, that these were built by giants from Africa. And that is what the locals told about Mzoura, it was built by giants and ogres.